The White House wants the public to know that President Trump was working hard over the weekend amid a partial government shutdown. 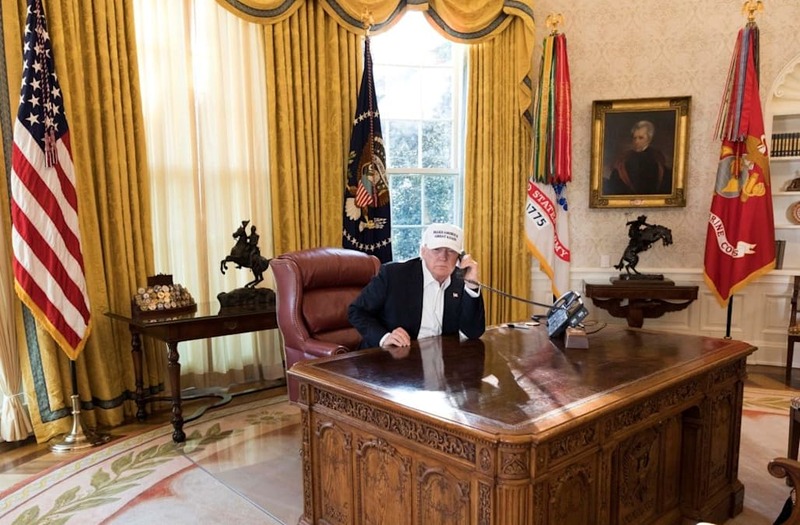 To that end, it released a photo of Trump sitting at a desk, with a phone to his ear, in the Oval Office and “receiving the latest updates from Capitol Hill on negotiations to end the Democrats government shutdown,” according to the White House. However, many Twitter users gathered a different impression from the image and questioned if he was even working at the time it was taken. “Honestly this looks like someone’s first time using a phone and a chair,” wrote one tweeter. “An emerging trend is that Trump and his staff have no idea how to stage photos to make it seem like he’s actually working,” someone else tweeted. “I too conduct most of my most important work with a phone in my hand and nothing on my desk, while staring vacantly off into space,” wrote another Twitter user. While at a press briefing on Saturday, White House officials told reporters that Trump was continuing to have various conversations with Republican leaders, CNN reported that Trump didn’t appear to be taking a leading role in the negotiations over ending the shutdown. “He did not appear in public. He hasn’t taken a meeting at the White House since Friday. And his only tweet of the day, calling for an end to the Senate filibuster, was roundly rejected by Republican congressional leaders,” CNN noted on Sunday.